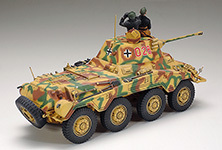 The German Sd.Kfz.234/2 "Puma" is rated as one of the most fearsome armored cars to hit the battlefields of WWII. It was one of four Sd.Kfz.234 variants which followed in the footsteps of predecessor Sd.Kfz.234/1; developed from August 1940 onwards, the Puma had a hard-as-nails monocoque form which packed a mighty punch with its 5cm KwK 39/1 gun and 7.92mm machine gun mounted on the rotating turret. Its capabilities went much further, however, an 8-wheel drive, 8-wheel steering system providing top class mobility and the 210hp diesel engine propelling the Puma at up to 80km/h. Great stamina was exemplified by an impressive range of 1,000km. Production was limited to just 100 units between December 1943 and September 1944, but the Puma sprung up on both the Western and Eastern fronts to terrorize opponents as a hard-hitting reconnaissance vehicle. 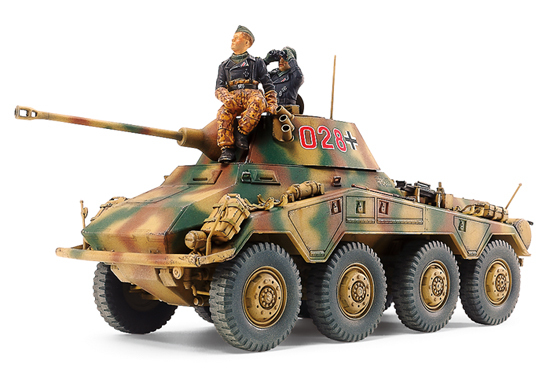 This is a 1/35 scale plastic model assembly kit depicting the Sd.Kfz.234/2 Puma. ★Length: 205mm, width: 66mm. ★Tamiya is pleased to announce this version of the classic Italeri kit with new and updated parts. 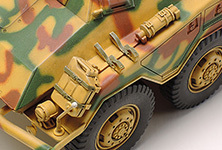 ★Refined jerry can and rack parts are paired with photo-etched parts to depict jerry can fastening belts. ★Brand new parts are included to depict muzzle brake, smoke discharger base, headlights, horn, lamps, command car antenna, jack and more! ★Turret-front firing port and turret-top ventilators are given new, sharper molding. ★Features updated mantlet shape, plus realistic depictions of cast metal surfaces. ★Guides have been added to aid with positioning and attachment of fenders, tool boxes etc. 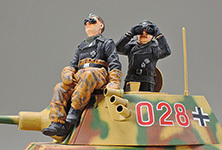 ★2 figures included to depict commander and crewman, while 2 marking options depict 1944 Western front unit vehicles. ★Vehicle parts are a product of Italeri. ★New and improved parts take this masterpiece kit to even greater heights! ★Updated parts improve upon the old jerry can, rack, headlight and horn parts. ★Brand new parts depict the jack, command car antenna and other features. ★Add another layer of awesome realism with these 2 realistic figures. 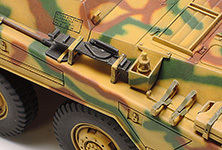 ★Photo-etched parts used to recreate jerry can belts offer excellent realism. 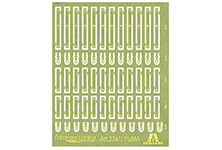 No more fumbling with photo-etched parts! Information is correct as of March 4, 2015. Specifications are subject to change without notice. Related Items - - Click on the images and links below for more information. 1/35 German Self-Propelled Howitzer "Wespe"